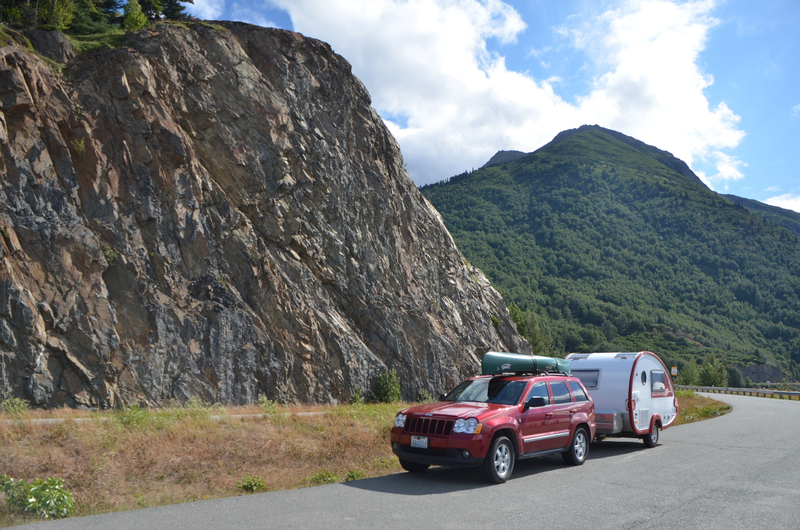 I had spent the night along Turnagain arm in a pull out. My intentions were to head back into Anchorage, to the west. This isn’t a huge pull out, but it has a small grassy median between the road and the paved pullout area. 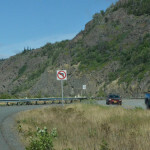 It is at a point where an arm of the mountain comes down and the mountain has been cut away to allow the road to have a more gradual turn as it rounds the point. 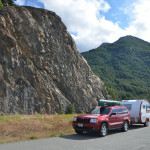 I was parked heading westbound towards Anchorage, and came to the west end of the pullout to head back onto the highway. But as I did this I spotted a “no left turn” sign planted near the end of the median. I looked a little more closely and realized that leaving in this direction would have meant crossing a lane of oncoming eastbound traffic and entering a lane of traffic that had just come around a bend. Mostly an issue with visibility and the highway is pretty busy. So I did a little fancy maneuvering and got myself ready for a tight right turn instead. This worked out fine and it was a nice morning so and the scenery was pretty here anyhow. I started down the highway and got no more than a mile when there were many brake lights ahead. I slowed down as well and we got down to about five miles per hour. 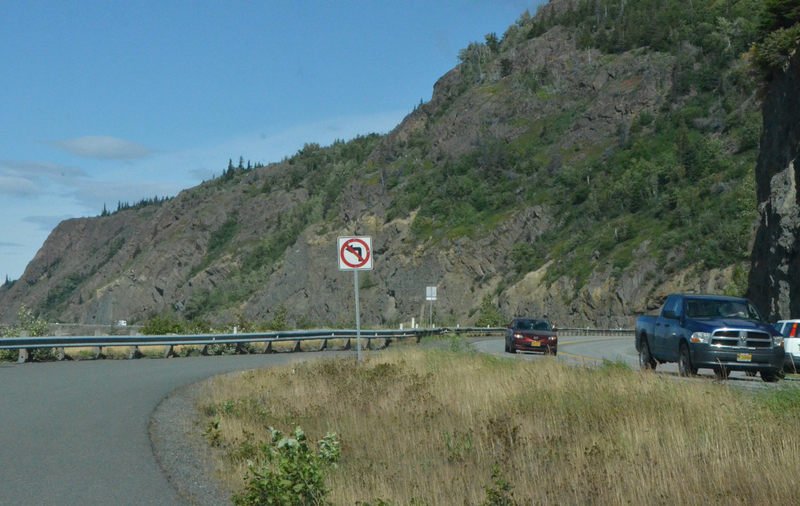 As I rounded the next turn there were cars parked along the road and some stopped in the middle, with people all along the guard rails and walking here and there. I figured there must be something to look at, so I watched for a parking spot. When I saw one I slipped neatly through the oncoming traffic and people and swooped into a spot. I still didn’t have any idea what I was going to see. I got out with the camera in hand and started looking where the people where pointing their cameras. Up on the cliffs above my head. So I looked mostly straight up and about all I saw was rock. 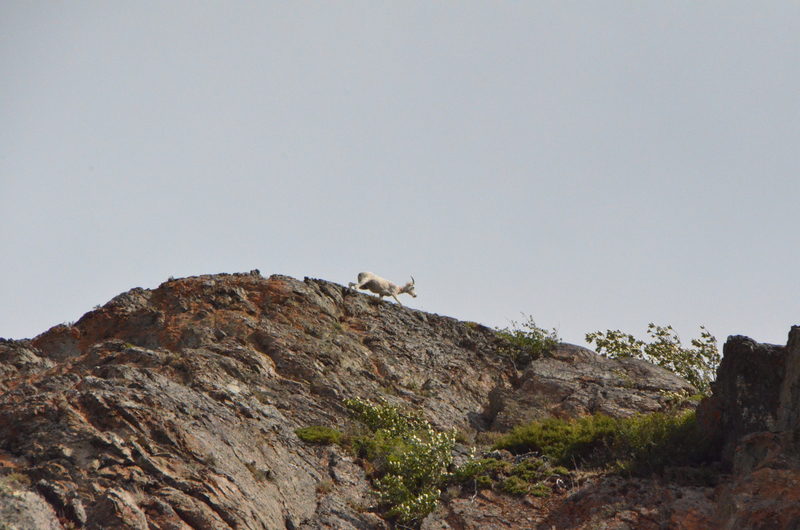 Then someone pointed and I saw the sheep walking on the top. I took a couple of pictures and then another person walking by said “oh, you need to see the sheep back over there” as they were returning from having done so. I crossed the road and rounded the corner and found myself looking across the road at a group of sheep close up and in plain view, eating and frolicking, wandering around right above the traffic below. 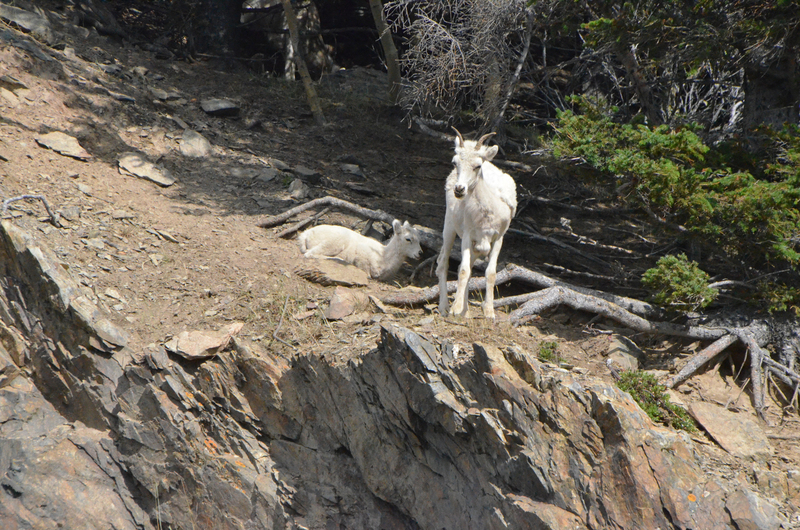 I watched for a while and eventually one of the elder sheep rounded them up and they headed up into the brush. I started back to the car, but by the time I was back around the corner they were too. But this time way up on the sheer rock wall. I watched a mother and kid eating as they moved around, hopping up here and down there. So a wrong turn ended up netting a pretty good sheep encounter. 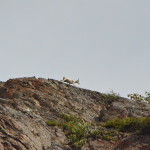 I hadn’t seen sheep close up in Denali, so this a nice treat. Oh, and the no left turn sign? Yeah, I think it was telling westbound travelers not to try to cross the oncoming traffic to get into this pull out, not really for folks already in the turn out. No left turn. First thing in the morning. I decided to go with the flow and make the tight right turn. Looking straight up at a sheep above my car. This was a small group of females and their kids. Males don’t stick around and they typically stay further afield. The sun was actually a little hot, I think the little one was enjoying the shade but it had moved. And out onto the upper rocks.